Sweetpea-Lifestyle: Style Me Chic Mondays - PINspirsation! 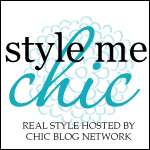 Style Me Chic Mondays - PINspirsation! The pastel color palette is very in right now. Using this lovely outfit I re-pinned on Pinterest, I have come up with 4 looks and 4 color palettes that will help ignite your inner-fashionista to embrace the pastels! I absolutely love this use of pastels. She uses LOTS of colors, but it is a cohesive look. The majority of the colors are pastels, and she uses great texture in her outfit to keep it interesting. 2. Something patterned. This cute gal's blouse is striped, yielding a pattern for her look. Small and classic pattern. No need to bring in the big floral prints, unless that is totally you! To the left you will find a pastel color palette. Using those colors, I've created an "Everyday" Look that goes from grocery shopping to lunch out with friends. It's easy, yet has all three style elements needed: plain, pattern, and texture. 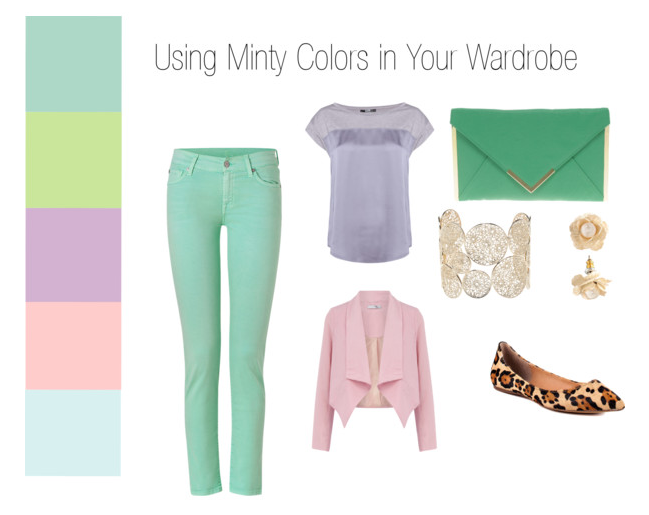 The minty jeans are the plain factor. The lavender top has two kinds of fabric, lending a subtle pattern. The leopard printed flats are the real pattern; and the bracelet gives a delicate texture. Using a pop of color in your outfit can also add characterization to your outfit. I have used three different pastels + one bright yellow clutch. The skirt is gathered adding texture - the blouse has a tinge of ruching at the top, the shoes are patterned with rhinestones, and the cardigan is plain! This would be a great outfit to wear to class or on the weekends. Now we are moving into a bit more dressy options. This would be great for the office or a working lunch, etc. Using a simple pink dress paired with suede teal shoes gives this outfit clean lines and fluidity. Adding the orange tote that has both texture AND pattern gives the outfit something extra. Subtle bangle and earrings are the icing on the top! If you are anxious about wearing sparkly items to work, use the classic pearl earrings/necklace combo. Or a simple braided golden bracelet! Finally, something dramatic! This gown is a gorgeous pale green that has texture due to the intricate ruching detail on the top of the dress. The shoe are plain. The earrings and bracelet are shiny and sparkly! And, the bright pink clutch adds a pattern and texture to the outfit. Using our three components isn't difficult. Using them well is the difficult part! We'll talk more on using Plain, Pattern and Texture later this week for Fashion Fridays! Great post!! I am always wary of pastels (especially at formal events, as you know I tend to go for black), but you've put these together in such a classy way! No more neon-looking mess. :) Off to find a pastel staple!